I thought long and hard about whether I wanted to write this, but in the end, I decided I wanted to be honest with you. Let me tell you about my Dad. Just over a week ago, I received the devastating news that my Dad had suddenly passed away. No warning, nothing. At 1am on Saturday morning, I was speeding down the M4 to Bristol, to get home to be with my family. It was the longest drive of my life, but Soph was beside me, her constant love and support spurring me on. As I drove, and wept, one phrase kept rattling through my head, ‘Thanks Dad x’. As many of you know, we’ve recently taken the plunge to embrace ‘The Good Life’, and have moved to rural Suffolk where we’re renovating a house and redesigning a garden. Last week, my parents were due to come and stay with us for a few days, and I couldn’t have been more excited. I was eager to show my Dad our garden, the house, and share the plans we have. I wanted to make him proud. 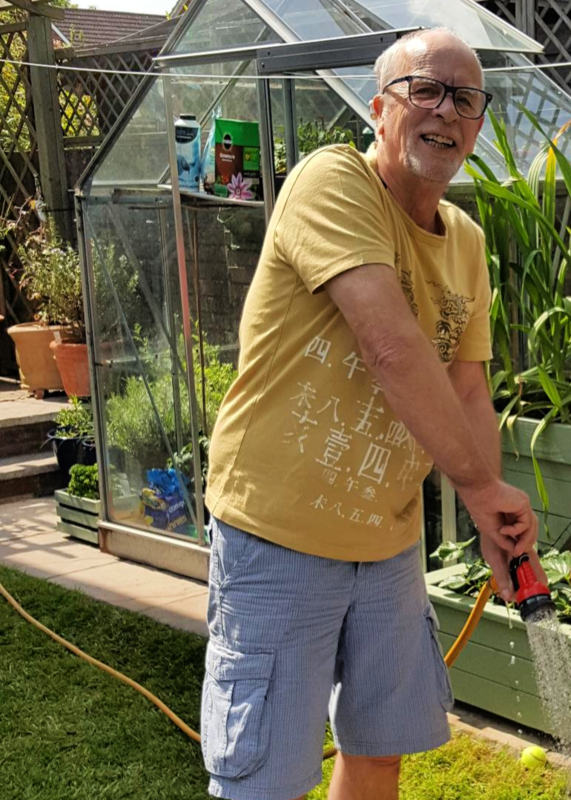 A big supporter of Agents of Field and a lifetime gardener, he was always one of the first to read our latest blog. He would often text me photos from his garden, or want to hear about our latest gardening adventures. When I first told him that we were considering this life change, he couldn’t have been more excited and supportive of us. ‘Go for it, son.’ He said. The week before my parents were due to come and stay, we had exchanged the usual telephone and text conversations. Never one to sit still, he had offered to help with laying the new floor in what will eventually be my office. But Soph and I both wanted him to relax while he was here, and I jokingly told him to ‘sod off’. Then on the Friday, a few hours before he passed away, after offering me some fatherly advice, I texted him, ‘Thanks Dad x’. These were my last words to him. He loved Christmas, and he loved gardening. He was the rock of the family; strong, wise, fun. Never faltering, he was always there without question. At the moment, I’m lost. The pain is crippling. He wasn’t just my Dad, he was my counsel, my best friend, and my hero. I’m not generally one to splash my personal affairs over social media, and I’m certainly not looking for sympathy, but so many of you have been very kind and supportive of Agents of Field, and I simply wanted to be honest with you and to explain our recent absence. I also wanted to let you know that Agents of Field will now be taking a short break over the Christmas period, but we will be back in early 2019. Although broken, we will laugh again, turning happy moments into many more precious memories. And during these times, I will always think of the true gentleman who helped make me the person I am today… ‘Thanks Dad x’. So, for now, my beautiful, loving wife and I would like to wish you all a peaceful Christmas and a joyful New Year. Previous Burgon & Ball Christmas Giveaway! This is not a post I can “like.” I am so very, very sorry. A huge loss to you and your family, Yes, the pain is crippling and will be for quite a while. Many, many years ago, my father died in February, and I didn’t start feeling happy until that August. Grief takes as long as it takes. And remember, to be mourned is to be loved, and your father certainly was loved. No parent could wish for a better tribute. Ade, that was beautiful, simply beautiful. My cheeks are wet with tears. Thank you for sharing your pain, and your honesty and I send you my deepest sympathy and every possible good wish for the future. Ade, Beautiful thoughts. My thoughts are with you. You are right, in time you will laugh again, you will have happy moments and build more memories too. For the now though, my deepest sympathies. Dom. Cheers fella! Hope you’re well. Thank you for your kind words Dom. Ade I am so sorry for your loss. Take as much time as you need, we can wait as long as it takes. Take care. So sorry to read such sad news. Sending you best wishes. Words will never be enough. Just take comfort knowing that we feel your pain and will wait as long as it takes. So brave to share this with us. Even though recovering from the shock of your father parting you are fortunate to have had so many memorable years with him. I lost my father, 87, in March. Not seeing him in his recliner every morning when I wake up was strange to get used to. Like my father, yours has won his race and now is enjoying his prize. We live to die eventually and how we live determines our prize. I didn’t know your dad, but I am sure he has a grand prize. Live well, my friend! Thank you so much for your kind words, sorry to hear of your loss. Best wishes fella! I’m so sorry for your loss. While each of our experiences of the death of a parent is different, I can understand having lost my own father just a few years ago. Still, every day I think of something I want to say to him or show him and probably it will be the same with you, too. Take comfort in the good memories–it sounds like there were many–and continue the loving relationship you two obviously had in its new form.